Blackberries are delicious little gems, well-suited for growing in the home garden. Many new varieties are thornless, making them easier to pick than wild blackberries. The berries not only taste great but are packed with beneficial nutrients. According to Gina E. Fernandez, small fruit specialist at North Carolina State University, blackberries can slow the aging process, improve cardiovascular health and fight cancer. Hull is a thornless variety that will produce large, firm, tart berries in late summer. Although the plant is hardy, the berries may be susceptible to damage in hot summer weather, making hull blackberries a better choice for cooler climates. Chester is a hardy, disease-resistant variety with high quality, tart berries that are especially good for canning or freezing. Although the plant is productive and vigorous, the berries, which are ready for picking in late summer, are susceptible to burn in hot summer climates. Triple Crown blackberries are late season berries ready for harvest in August and September. The plant isn't suitable for climates with extreme summer heat, as the berries may scorch. In cooler climates, the large, black fruits are sweet and delicious. Triple Crown is a thornless variety, with sturdy canes that should be trellised or staked. Boysen blackberries are trailing blackberries available in both thorny and thornless varieties. The dark-maroon berries are large and soft, ready for harvest in June and July. 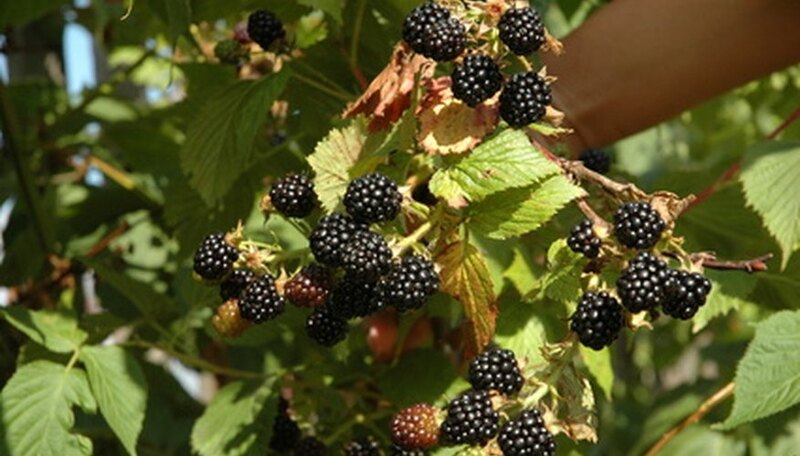 Boysen blackberries are sturdy, heat-tolerant berries that will do well in hot summer climates. Kotata blackberries, ready for picking in June and July, are large, firm berries with a glossy black color and delicious flavor. Kotata blackberries are vigorous growers and the canes have thorns. The plant is only moderately heat-tolerant and may not be the best choice for hot summer climates. Logan blackberries are dark-red berries with an excellent flavor. Logan berries are produced earlier than most varieties, and will be ready in early summer before the hottest part of the year. Logan blackberries are available in both thorny and thornless varieties. Ollalie is a heat- and cold-tolerant plant that will produce medium to large, sweet, black berries that ripen between late May and early July. Ollalie is a thorny variety. Silvan berries will be ready for picking in mid-June. The berries are large, slightly firm with an excellent flavor. Although Silvan blackberries aren't tolerant of extremely high temperatures, the plant will grow vigorously in cooler climates. Silvan is a thorny variety.